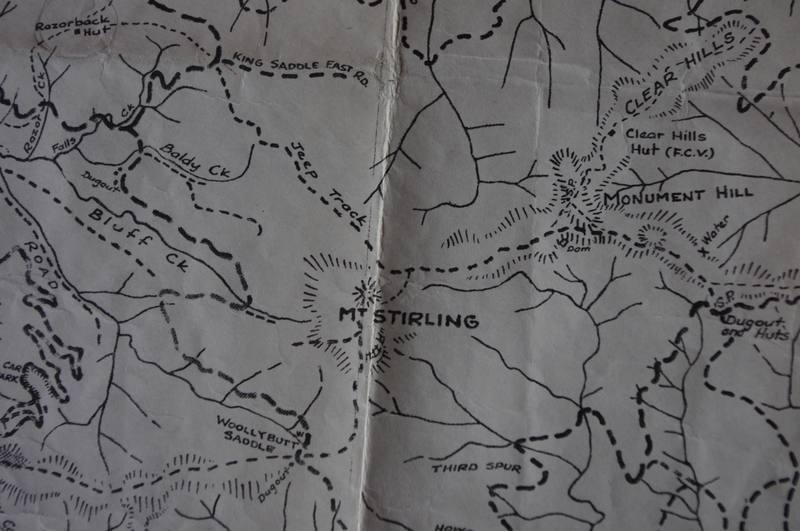 Anyone who has hiked and skied the mountains between Buller and Stirling, and from The Bluff to Howitt and Cobbler and is over 30 probably knows the wonderful maps of Stuart Brookes. Stuart has produced maps of the Alps and other popular walking areas since the late 1940s. As a teenager on my first walking, snow shoeing and skiing adventures in the area around the Howqua River, I fell in love with Stuart’s black and white map ‘Watersheds of the King, Howqua & Jamieson Rivers’. It had basic landform details shown through shading and all the features that a walker needed: good campsites, places where you could get water on the high ridges, routes and cairned trails rather than just the marked roads. I would get a new version every couple of years, and later versions were in multi colour and had contours. But they still had a sense of richness that are rare in modern maps. This was country that Stuart knew intimately and the maps evoked a rich sense of place. 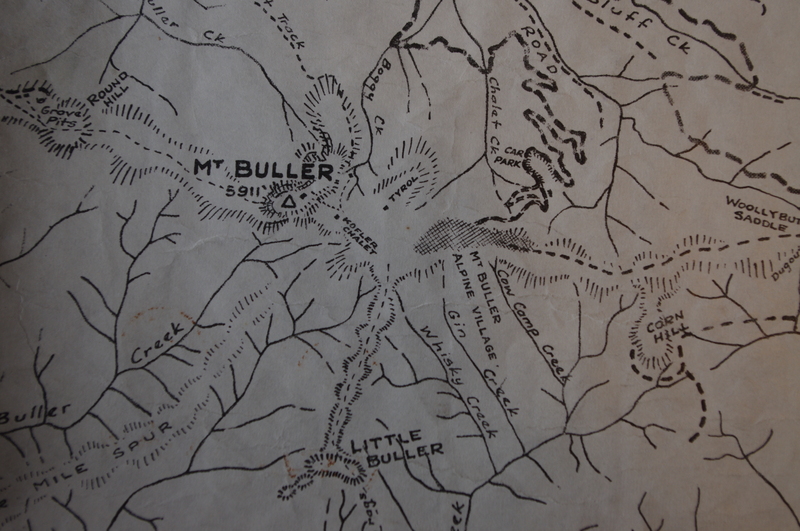 Nowdays I assume that the map of choice for those on foot when exploring this region is the (excellent) Spatial Visions map of the Buller Howitt Alpine Area. 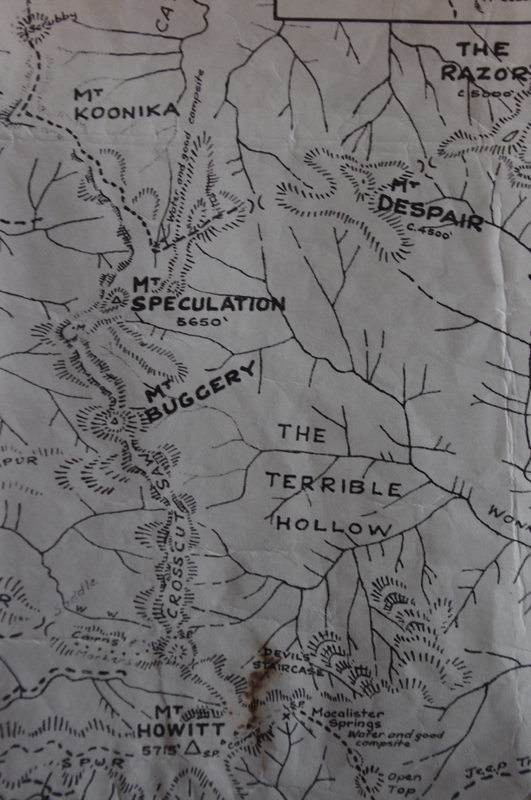 But the old maps produced by Stuart for the Victorian Mountain Tramping Club retain a depth and vividness that speaks through the years. These are maps of this place, of these mountains and deep river valleys, maps that could not be made solely in a building in Melbourne. 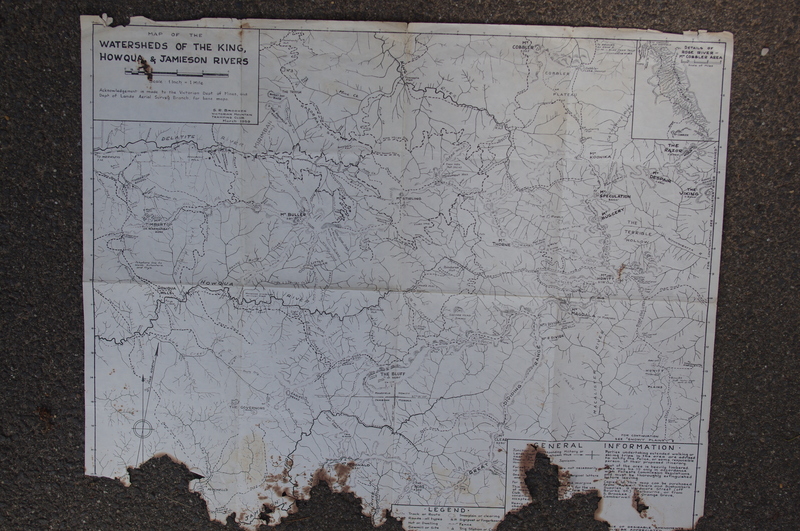 Recently two friends, Barry and Dianna, gave me a copy of the map from 1959 (thanks!). It feels like a work of art, reaching out from a half century ago. Apart from the sense of stability – the mountains and streams are still there – what is striking is the level of development that has happened over these years. Often being in the mountains can feel timeless. More and more I feel the hand of climate change as I wander through burnt forests. But the land still feels ancient and, in many ways, unchanged. It will be here long after we are gone. But the changes that have happened in almost all sections of this map in little more than 50 years are still sobering. Mt Stirling. Before Bluff Spur, GGS and Craig’s Huts, and no ski school or bistro at Telephone Box Junction. 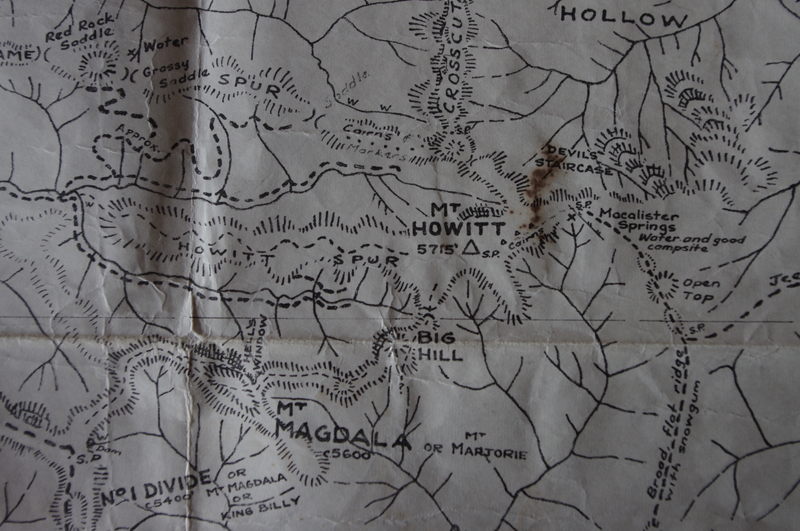 Mt Howitt, pre the Vallejo Gantner Hut at Macalister Springs (& the warning about the intestinal worms introduced by cattle in the stream at Mac Springs). Great maps – I have a framed well worn copy of the 1965 edition which I used for many years. In fact during the 1990’s I contacted Stuart Brookes to ask where I could get a more up to date copy which were no longer available in the stores and he invited me over to his home and generously gave me a copy of what was then the latest edition. Thanks for the blog – makes for enjoyable reading.